Team messaging apps like Flock have transformed the way we communicate at work. With an always-on, searchable stream of messages and notifications, they make online collaboration a breeze. Add the ability to share files from Google Drive or Dropbox, or integrations with project management tools — and your work chat app has now become a powerful productivity platform! Interrupted context switching happens when you move from one task to another, before the first task is complete. Why does this matter? Because the human brain was not designed for multitasking. And every time you are interrupted in the middle of a task, it takes a while for you to resume it. Working on a project with tight deadlines? Pin relevant 1–1 chats and channels to access them easily. Conversely, unpin relevant chats once you’ve finished a project so your Active Chats panel bubbles up only the most important conversations. Too many notifications from water-cooler conversations in a channel? Go ahead and mute noisy channels. You can always come back to them later and read through stuff you missed. Or check out the All Channel Feed. The easiest way to be more productive is to cut the noise and focus on one task at a time. 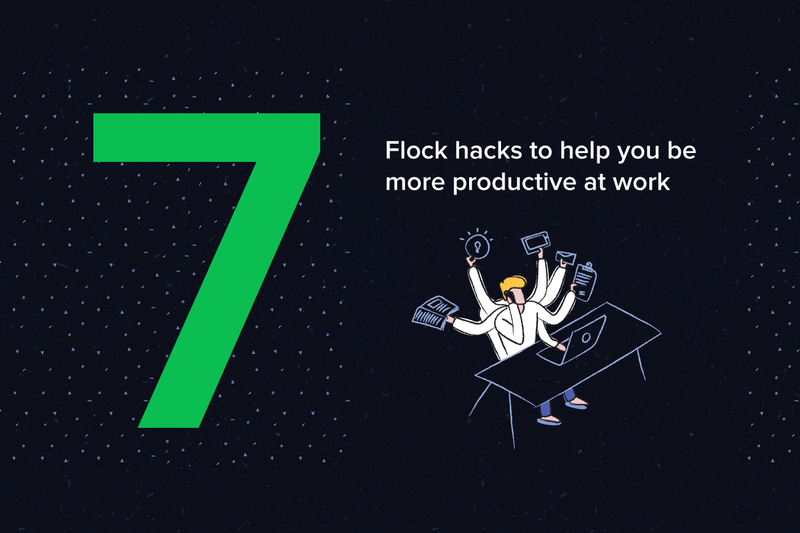 Use Flock’s DND mode to silence all notifications for a chunk of time and get things done. When you come back, you can see a list of all unread messages in the All Channel Feed. Too many tasks jostling for your attention? Use Flock’s To-Dos feature to quickly create a list. You can use the /todo slash command to create a shared to-do in a conversation. Once you’re done with a task, check it off, and everyone in the conversation is notified. You can also assign tasks, with due dates, to others. We all need a reminder or two for stuff that slips through the cracks, don’t we? To quickly set a reminder, in a 1–1 chat or channel, you can use a slash command /remind or even set a reminder against any message. You can also use the Reminders app to create and view your reminders in one place. For conversations in a channel, use @ mentions to call out teammates when they need to know or answer something. This lets you cut through the noise, sends a personalised notification to the teammate, and helps everyone stay on the same page. Need to discuss something with a colleague? Use Flock’s built-in video conference feature to talk to folks no matter where they are. Discussions on video happen faster than text-only chats and are great for quick face-to-face meetings. Use the slash command /video to start a video call with a teammate. These simple tips can help you get things done without distractions, while staying in touch with your team. Give them a try and do great work every single day! If you have any similar tips for the thousands of Flock users across the world, share them in the comments below.